A Biography of Octave Chanute. See the University of Illinois Press release page for more information. "An impressive, truly significant addition to the field of engineering and aeronautical history. Simine Short shows how Octave Chanute's personality and method of problem- solving enabled him to make meaningful contributions in diverse fields such as railroad and bridge engineering, stockyard design, and the early phase of aviation." "As the first detailed biography of civil engineer and aeronautic pioneer Octave Chanute, this book fills a gap in the existing literature and is suitable for both the lay reader and the expert." "We have waited a long time for a solid biography of Octave Chanute. Simine Short has given us a book worth waiting for. She succeeds in situating the details of Chanute's long life and extraordinary career squarely in the context of his time." French-born and self-trained engineer Octave Chanute designed America's two largest stockyards, created innovative and influential structures such as the Kansas City Bridge over what was commonly known as the unbridgeable Missouri River, and was a passionate aviation pioneer whose collaborative approach to aeronautical engineering problems encouraged several want-to-be aeronautical experimenters, including the Wright brothers. 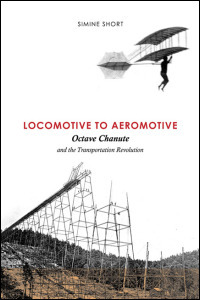 Drawing on a rich trove of archival material and exclusive family sources, Locomotive to Aeromotive is the first detailed examination of Chanute's life and his immeasurable contributions to the fields of engineering and transportation, from the ground transportation revolution of the mid-nineteenth century to the early days of aviation. Aviation researcher and historian Simine Short brings to light in colorful detail many previously overlooked facets of Chanute's life, in both his professional accomplishments in multiple disciplines and his personal relationships as a respected mentor and friend to many civil engineers and aviation pioneers. In the latter part of the 19th century, few men were committed to the establishment of engineering as a profession on par with law or medicine, but Chanute devoted much time and energy to the newly established professional societies that were created to set standards and serve the needs of civil engineers. Though best known for his aviation work, he became a key figure in the opening of the American continent by laying railroad tracks and building bridges, experiences that later gave him the engineering knowledge to build the first stable aircraft structure. Chanute also established a procedure for pressure-treating wooden railroad ties with an anti-septic that increased the wood's life-span in the tracks. Establishing the first commercial plants, he convinced railroad men that it was commercially feasible to make money by spending money on treating ties to conserve natural resources. As a way to track the age and longevity of railroad ties and other wooden structures, he also introduced the railroad date nail in the United States. A versatile engineer, Chanute was known as a kind and generous colleague during his career. Using correspondence and other materials previously not available to scholars and biographers, Short covers Chanute's formative years in antebellum America, as well as his experiences traveling from New Orleans to New York, his apprenticeship on the Hudson River Railroad, and his early engineering successes. His multiple contributions into the realms of railway expansion, bridge building, and wood preservation, established his reputation as one of the most successful and distinguished civil engineers in the nation. And instead of retiring, he utilized his experiences and knowledge as a bridge builder in the development of motorless flight. Through the reflections of other engineers, scientists and pioneers in various fields who knew him, Short characterizes Chanute as a man who believed in fostering and supporting people who were willing to learn. This well-researched biography cements Chanute's place as a pre-eminent engineer, pioneer, and mentor in the history of transportation in the United States and the development of the airplane. Simine Short is an aviation historian who has researched and written extensively on the history of motorless flight. Her first book, Glider Mail, an Aerophilatlic Handbook, received numerous research awards world-wide and is considered a standard reference by aerophilatelists and aviation researchers. She lives with her husband outside Chicago, Illinois.